The exclamation point at the end of question number four is exactly how the question was written and not of my own theatrical embellishment. I’m not quite sure why today’s topic gets such fanfare but whatever, let’s get on with it. First story…I’ll go one better and tell you about my first poem. I wrote it when I was eight or nine and it went like this…ready? It’s really deep. Who will wake this day of dawn? I remember my father found it and asked me to explain it to him. The memory of quickly scrambling to make something up is still vivid in my mind even though that was over forty years ago. I guess it must have satisfied him because he got this look in his eye that clearly said, “My child is a genius!” (Or he was trying hard not to laugh.) The roots of feeling like a colossal fraud had been sown. I next remember a story I wrote in fifth or sixth grade about a witch named Sarah Coleman. Poor little Sarah had been shut out by her peers for being weird until she rescued one of the cool kids from drowning. She lived happily ever after. Clearly a seldom used MG plot worthy of revisiting with today’s paranormal emphasis. I did my own illustrations too. I won’t be revisiting those. 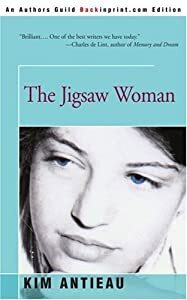 Moving into my early adulthood, I started some incredibly cryptic story called The Jigsaw Woman (not the book in the image…voleur!!). It was so deep, even I didn’t understand it, sort of like that poem I wrote when I was nine. I probably should have finished and submitted it but I lost it somewhere between moves. Then we come into my most recent writing phase, begun in November 2008. I’ve already mentioned my first trunked novel and that’s more attention than it deserved, other than serving as a horrifying cautionary tale of what not to do. That one, set in Hollywood, was about a nearly forty year old widow who falls for younger man. It might have had potential had I known more about the evils of infodumping, flashbacks, Mary Sue’s, children as props (see day 2) and this elusive thing called an interesting plot. It did snag the most wonderful beta reader though, who’s stuck with me and I am humbly grateful for her. I can snark about my earlier writings now because I know I’ve gotten better with practice and a whole lot of reading. All the works I’ve mentioned in this post were stepping stones, exercises to develop writing muscles. A year from now, I’m sure I’ll look back on my current amazing WIP and say the same about it. But that’s okay because that’s the nature of progress–being able to look back and discern a clear difference between where you were and where you are. Probably was…or the person who wrote the book pictured found it. Ha! Stringing pretty words together to create a patchwork of sound and rhythm does not mean there’s any meaning. I eventually learned that…I think.